Contrary to what many believe, Santa Claus as we know him today – sleigh riding, gift-giving, rotund and white bearded with his distinctive red suit trimmed with white fur – was not the creation of the Coca Cola Company. Although their Christmas advertising campaigns of the 1930s and 40s were key to popularising the image, Santa can be seen in his modern form decades before Coca Cola’s illustrator Haddon Sundblom got to work. Prior to settling on his famed red garb and jolly bearded countenance, throughout the latter half of the 19th century, Santa morphed through a variety of different looks. From the description given in Clement Moore’s A Visit from St Nicholas in 1822, through the vision of artist Thomas Nast, and later Norman Rockwell, Mr Claus gradually shed his various guises and became the jolly red-suited Santa we know today. Below we’ve put together a little pictorial guide showing his evolvement through the ages. The name Santa Claus has his roots in the informal Dutch name for St. Nicholas, Sinterklaas (an abbreviation of Sint Nikolaas). St. Nicholas was a historic 4th-century Greek saint (from an area now in modern day Turkey) who had a reputation for secret gift-giving, such as putting coins in the shoes left out for him. He was also famous for presenting the three impoverished daughters of a pious Christian with dowries so that they would not have to become prostitutes. St. Nicholas “Lipensky” as he appears on a Russian icon dated to 1294 from Lipnya Church of St. Nicholas in Novgorod – Source. Being the patron saint of children St. Nicholas has long been associated with giving gifts to children. The parallels to the modern day Santa Claus don’t end there. In his Dutch form of Sinterklaas he was imagined to carry a staff, ride above the rooftops (on a huge white horse) and have mischievous helpers who listened at chimneys to find out whether children were being bad or good. These features all also link him to the legend of Odin, a god who was worshipped among the Germanic peoples in North and Western Europe prior to Christianization. Although in Europe the feast of St. Nicholas, typically on the 6th December, was very popular throughout the middle ages, after the reformation in the 16th century the celebration died out in most Protestant countries, apart from Holland where the celebration of Sinterklaas lived on. Another important tributary to the image of Santa Claus was the phenomenon of Father Christmas – also known as Old Father Christmas, Sir Christmas, and Lord Christmas – a traditional figure in English folklore and identified with the similarly bearded Old English god Woden. He typically represented the spirit of good cheer at Christmas, but was not associated with either children or the bringing of gifts. Although the east coast of America was full of Dutch settlers, it was not until the early 19th century that the figure of “Sinterklaas” would make his way properly across the Atlantic and so give birth to the Americanised Santa Claus. 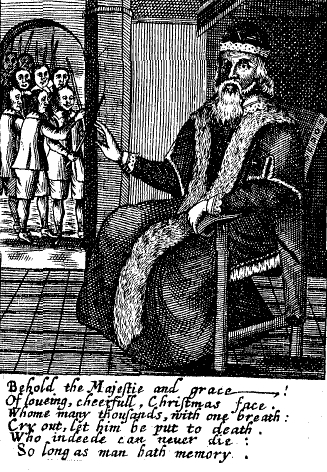 Following the Revolutionary War the already heavily Dutch influenced New York City (formerly of course named New Amsterdam) saw a new surge of interest in Dutch customs, and with them St. Nicholas. In 1804 John Pintard, an influential patriot and antiquarian, founded the New York Historical Society and promoted St. Nicholas as patron saint of both the society and city. On December 6th 1810 the society hosted its first St. Nicholas anniversary dinner and Pintard commissioned the artist Alexander Anderson to draw an image of the saint to be handed out at the dinner. In Anderson’s portrayal he was still shown as a religious figure, but now he was also clearly depositing gifts in fireside stockings and is associated with rewarding the goodness of children. While “St. Nicholas day” never quite took off in the way Pintard wanted, Anderson’s image of “Sancte Claus” most certainly did. A year before the New York Historical Society’s feast the author Washington Irving had written about Santa in his satirical fiction Knickerbocker’s History of New York, describing a jolly St. Nicholas character as opposed to the saintly bishop of yesteryear – one who flew in a reindeer pulled sleigh and delivered presents down chimneys. The next key step to securing the image of Santa Claus was the 1822 poem entitled A Visit from St. Nicholas written by Clement Moore, later better known as The Night Before Christmas. Moore drew upon Irving’s description and Pintard’s New Amsterdam tradition and added some more Odin-like elements from German and Norse legends to create the all-winking, sleigh-riding Saint and also the names for his flying reindeer. As time went by, more and more was added to the Santa Claus legend. 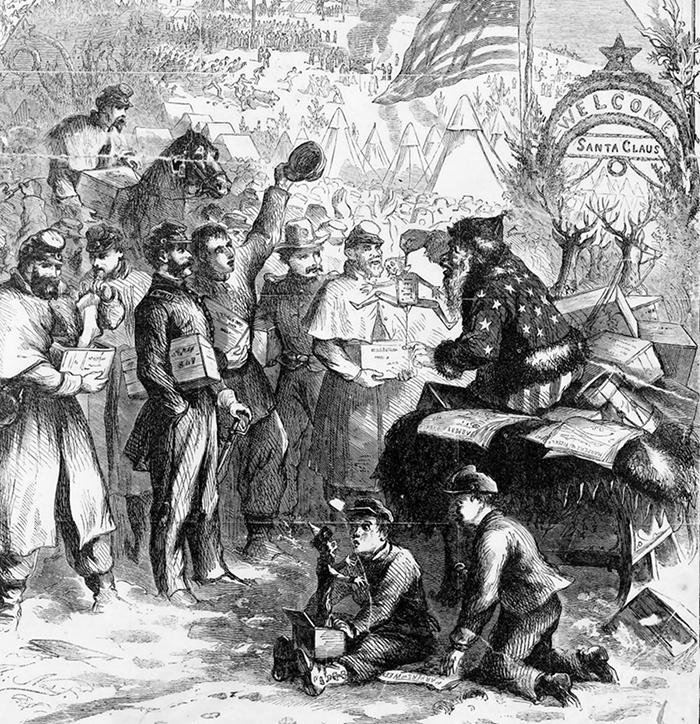 The cartoonist Thomas Nast established the bounds for Santa Claus’ current look with an initial illustration in an 1863 issue of Harper’s Weekly, as part of a large illustration titled “A Christmas Furlough”. Detail from Thomas Nast’s illustration “A Christmas Furlough” for the front page of a 1863 issue of Harper’s Weekly. In later Nast drawings a home at the North Pole was added, as was the workshop for building toys and a large book filled with the names of children who had been naughty or nice. Although Nast had gotten the paraphernalia of reindeer, sleigh, etc down to a tee, the famous red suit was still yet to be set. 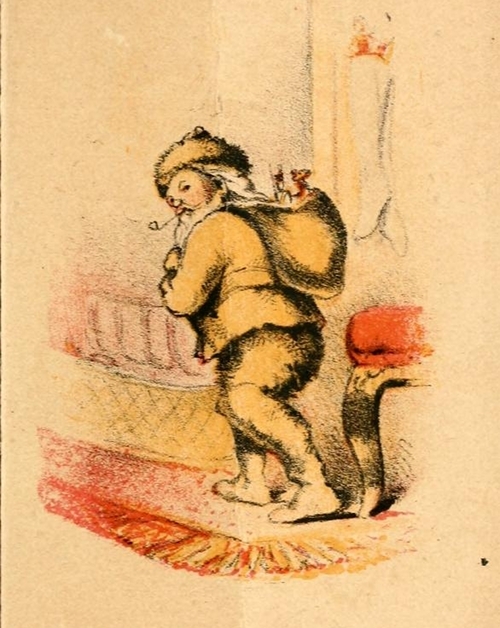 Over the decades Santa would be depicted in a variety of colours such as blue, green and the yellow as pictured in this 1864 edition of Moore’s “A Visit from St. Nicholas”. 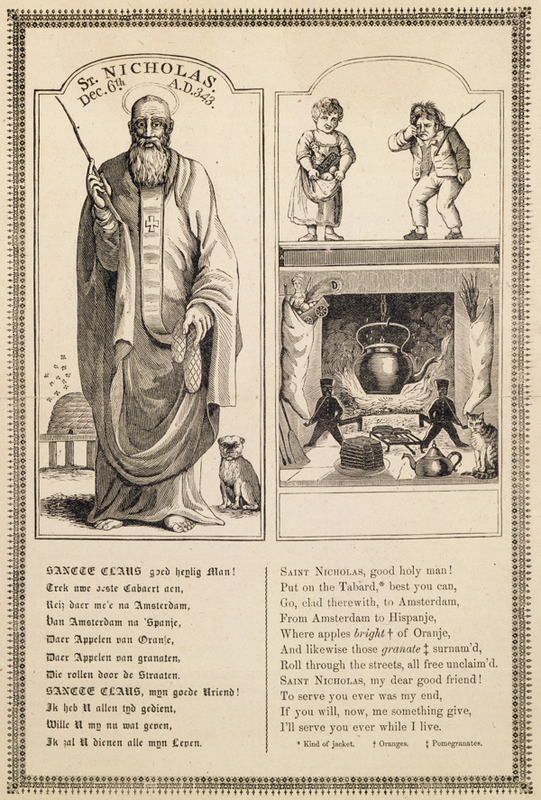 Illustration from the 1864 edition of Clement Moore’s poem A Visit from St. Nicholas – Source. In this 1868 advert for Sugar Plums we see the red of the jacket, but the hat is green and he appears to have no trousers on at all. Colour version of Thomas Nast’s famous image below – Source. The Life and Adventures Of Santa Claus by author of The Wizard of Oz, L. Frank Baum, with its elaborations and much added detail went a long way to popularising the legend of Santa. However, in the cover to the first edition of Baum’s book we see the red of his suit is still yet to be ‘mandatory’. 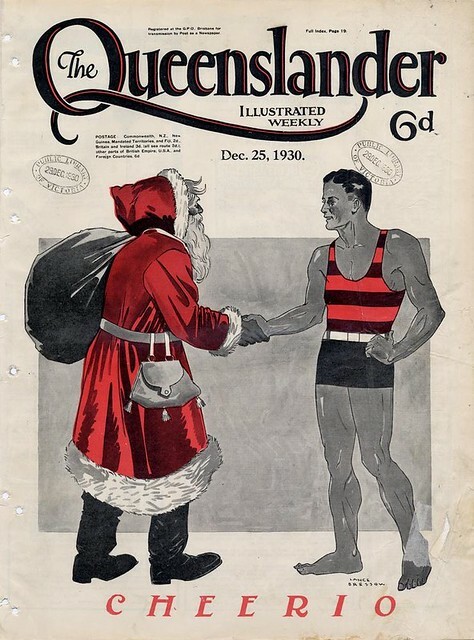 In this cover for Puck illustrated by the Australian Frank A. Nankivell, we see perhaps for the first time a depcition of Santa which is indistinguishable from that of the present day. Santa Claus as illustrated by Frank A. Nankivell in Puck, v. 52, no. 1344 (December 3 1902) – Source. In this Canadian department store brochure from 1906 we see that Santa, with his black trimmed suit and bobble-less hat, was still able to deviate from his typical image. Cover of the Eaton’s department store Christmas catalogue for 1906, showing an image of Santa Claus. Toronto, Canada – Source. The illustrator Norman Rockwell, with his many depictions throughout the 1920s, was a key player in cementing Santa’s modern look. Here is an early illustration of his from before the First World War. 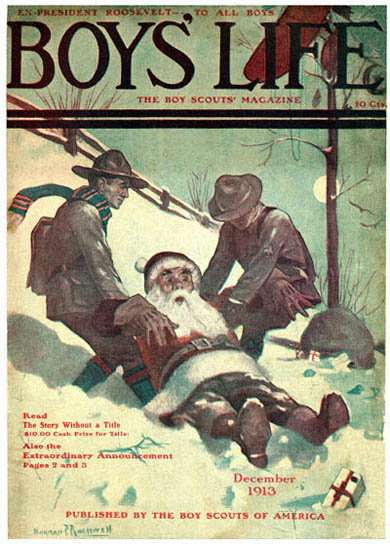 Norman Rockwell’s cover of Boys’ Life published December 1913 – Source. An Japanese illustration from 1914, showing the spread of the Santa legend had reached far wider than just Europe and America. Santa appears in classic form in this piece of U.S. WW1 propaganda. 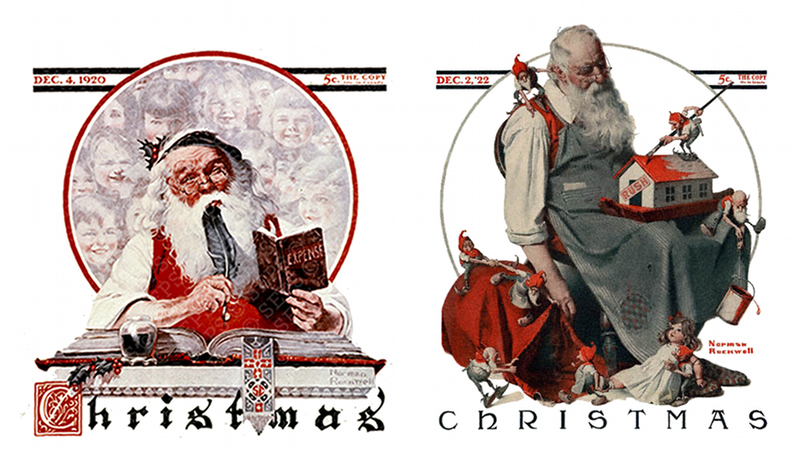 Pictured here are just two of Norman Rockwell’s many Santa themed covers for the Saturday Evening Post. Like Sundblom’s depictions for Coca Cola more than a decade later, these pictures of Rockwell’s give a very physiologically human and naturalistic aspect to the character as opposed to the more cartoonish features which had gone before. Santa in Australia in 1930. In the U.S. Second World War poster below Santa takes a radical departure from the jolly red suit and dons the dour shades of war. A poster from the Office for Emergency Management, War Production Board, circa. 1942 – Source.